SF SAID: Phoenix selected for the IBBY Honour List! 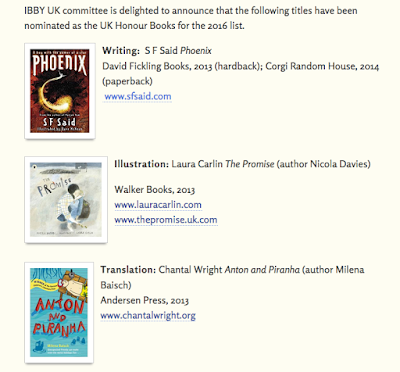 Phoenix selected for the IBBY Honour List! I'm amazed and delighted to announce that Phoenix has been selected for the 2016 IBBY Honour List! IBBY is a fantastic international children's literature organisation. It brings together writers, illustrators, publishers, academics, librarians, teachers, literacy workers, booksellers and parents from over 70 countries around the world – from Afghanistan to Zimbabwe. And every two years, IBBY's Honour List selects outstanding recent books from each of its member countries. Previous UK Honour List books include Frank Cottrell-Boyce's The Unforgotten Coat, Marcus Sedgwick's Revolver, Linda Newberry's The Sandfather, and Philip Reeve's Here Lies Arthur. 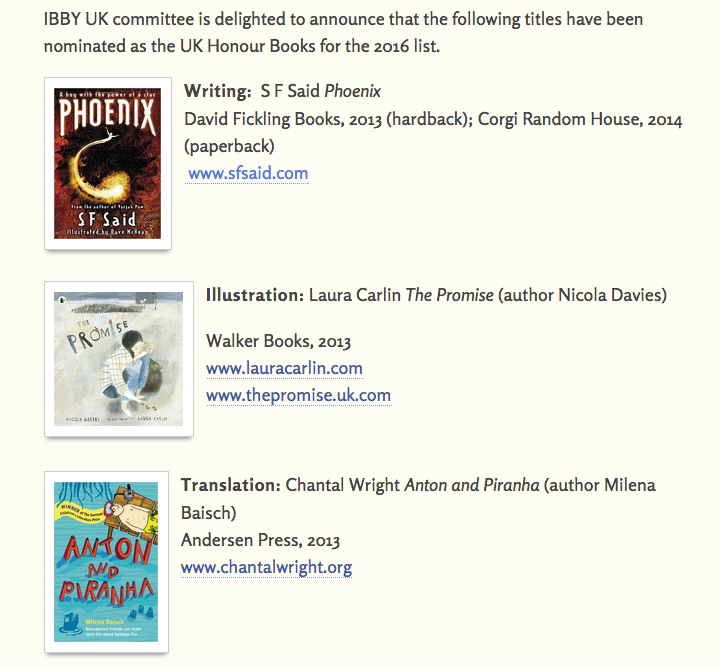 It's incredible to see Phoenix in that kind of company, because those books show how dedicated IBBY is to supporting the very best writing for young people. 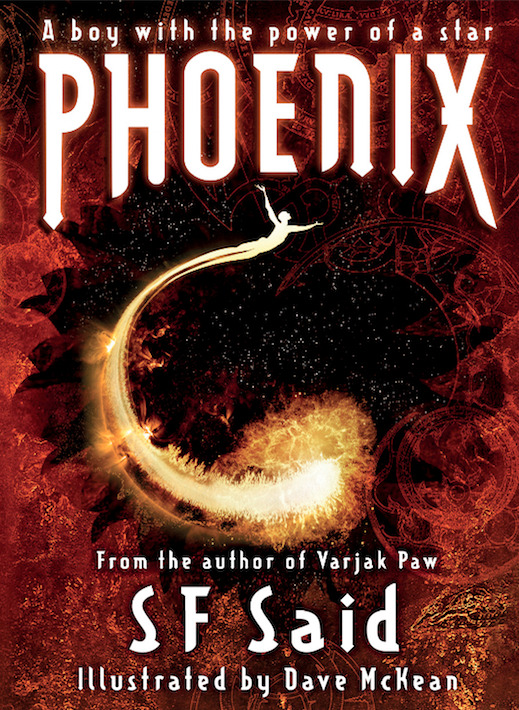 Phoenix skilfully integrates comments about our contemporary world - on war and peace, prejudice, borders and barriers to migration, political and moral questions - into a fast-paced and exciting science fiction narrative. I'd like to say a massive thank you to everyone at IBBY. Phoenix took me seven long, hard years to write – but at a moment like this, all that work feels totally worthwhile! And here's a link to a piece I wrote for the Guardian all about IBBY, and how children's books can help to build a better world! It really deserves it's place on the list. Well done. Thank you so much, Anna! That's incredibly kind of you, and very much appreciated. sf said i was wondering if you could come to my school st Patrick community school red deer Alberta the reason i chose you is because your an a awesome author your books are so addictive i cant hardly put them down you can come anytime you want this month except for June 29 and 30 i would really appreciate it you can contact my teacher 403 343 3238 my school is st Patrick community school red deer Alberta #300 HOLT ST and thank you. Thank you so much for your lovely message, and your kind words about my books! I'm based in the UK, and I'm not currently doing school visits overseas, so unfortunately I can't visit your school at the moment. But here's a link to a video that you might enjoy, where you can see me talking about my books! hi sf its me again that's ok if your not doing visits but could you do a Skype chat please cause its a school project to pick an author and of course your my favorite author and thank you and please contact my teacher 403 343 3238. I don't do Skype, I'm afraid, but if you'd like to leave me a few questions for your project, and an email address to reply to, I'll send you some answers?